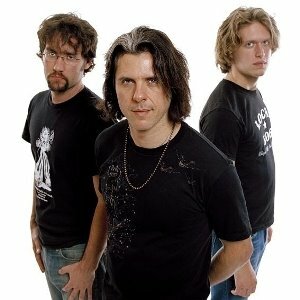 Alex Skolnick - "Renaissance Man"
Alex Skolnick may be best known for his work in Testament, but really his jazz fusion trio is a passion and a love of his. Whether he's playing serious metal or turning his axe to more subtle melodies, though, the truth stands out - he's an exceptionally talented guitarist. I had the chance to pose some questions to him recently about his trio, his return to Testament and more. WORMWOOD CHRONICLES: Since the last time we chatted you've gotten back into Testament. How did that come about? ALEX SKOLNICK: A couple years ago, we got an offer to do a reunion tour, which led to more tours and an album. WC: How has it been going? AS: It's been going great. It's been nice to step back into it but with Chuck and Eric having learned a lot of lessons by keeping the band going through the '90's, and my own experiences in other genres of music. This combined experience and wisdom has helped. The "Formation of Damnation" album has done really well and it's been good to see the band getting its due after all this time. WC: Where does that leave your trio? AS: We've just recorded what I feel is our strongest trio album. Despite Testament being a much higher profile and, at least last year, busier act, the trio is a main project, not a side project. I'm not saying Testament is a "side" project either, but with the trio- I formed it, I direct and produce it and write most and arrange most of the music with the assistance of my awesome players, Matt and Nate. Testament is a band that someone else formed and I'm happy to be a part of that vision, but the reality is, my role there is much smaller. The trio is a much smaller project but my role is much bigger. We have a lot of plans for 2010. WC: Besides the Testament situation, is there other news for you to catch us up on? It's been a while. AS: I played as a guest on Rodrigo Y Gabrella's new album 11/11, as well as recording a jazz guitar instructional video for Rockhouse which will be in stores in January. I've produced an upcoming EP for the band of former Iraqi refugees Acrassicauda, there was a film about them www.heavymetalinbaghdad.com, I'm also producing another EP for an amazing young singer, Adrianne Warren. It's rock/soul music with horns, organ etc. - very '70's. Both EP's will be out by early next year. I'm also writing a lot, my literary blog is www.skolnotes.blogspot.com. And I'm on tour with the Trans-Siberian Orchestra now through next January. AS: Writing essays and prose, which I'm doing now, but I'd be doing it more. AS: Putting out the new trio album, coordinating the other studio projects I've been working on, recording a new Testament album - and lots of touring - plus a metal guitar instruction video. WC: Do you think that downloading of music is a help or hindrance to the careers of musicians? It's been said by the major labels that it's essentially the heart of all the problems they are having in terms of lower sales ... would you agree? AS: Yes, but you can't stop it. The major label system was severely flawed from the beginning and something was bound to take it down. AS: I don't mind it. I'm in a position where I'm able to make a living from music and not have it be affected by people taping the live shows - as long as they buy the albums. AS: It would be some character whose evil consists of sucking the soul and emotion out of music and art and creating bland, cookie cutter rock and smooth jazz/instrumental pop/elevator music and spreading it across the world. AS: Lately, I've been enjoying some quirky new NY bands, like Lightning Bolt and Deerhoof. I also like this moody rock instrumental album by Pelican - "The Fire In Our Throats Will Beckon The Thaw". WC: Finally, are there any closing thoughts you'd like to get out there? AS: I just read an inspiring quote with the actress Hillary Swank, talking about Amelia Earhart, whom she plays in a new movie: "In the end, we're usually either living for someone else and somewhere in there we lose track of why we're here, for ourselves. I found it remarkable that she never veered from the path that was right for her."